View More In Hearing Protection. An usual concert, the sound decibel is about 105 to 115DB, our hearing will get damaged if stay over 3 minutes. Therefore, this Punasi earplugs are designed to filter the noise and reduce the hearing damage caused by sound. Lightweight ear plugs are comfortable to wear, and will not let your ears feel bulky. Pick this silicone earplugs up if you're musician, DJ, construction worker, a waiter or barman at a club, or when you go to concerts and festivals. These invisible earplugs can help sleep, but please be noted it's made to Reduce noise, Not completely cover the sound. PREMIUM QUALITY: This pair of ear plugs are made of Non-Toxic silicone, protect your ear from bacteria and allergy. Upgraded Version Earplugs & HEARING PROTECTION: With a Noise Reduction Rating (NRR) of 27 decibels, these high fidelity earplugs can Filter the noise and preserve the sound quality of the music. 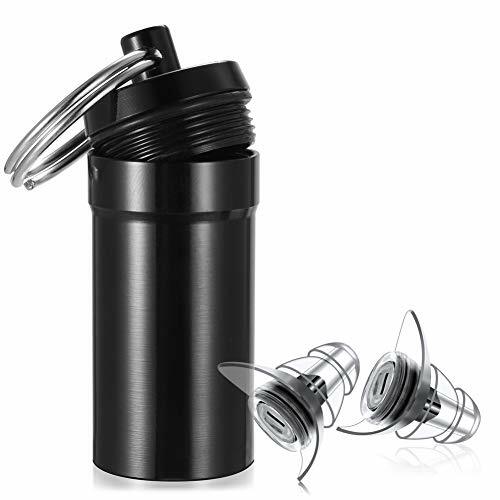 PORATBLE: Come with compact aluminum-made container, enough space for you to put earplugs inside, and the key ring design makes it easy to attach on your belt or keys. EASY TO USE: Gently pull up the upper part of the ear, push the earplug at the ear canal, gently twist to the right position to ensure and create a comfortable fit! WIDE APPLICATIONS: You can use these earplugs everywhere: use them on a plane, a train, a box, in a car, in a tree, use with a fox, for shooting, travel, sleeping, work, concerts, gigs, bars, DJ and most noisy places. If you have any questions about this product by Punasi, contact us by completing and submitting the form below. If you are looking for a specif part number, please include it with your message.